This morning I set off continuing to follow the river Sauer along the old railway line which is great because they are so flat and any incline is so gradual. 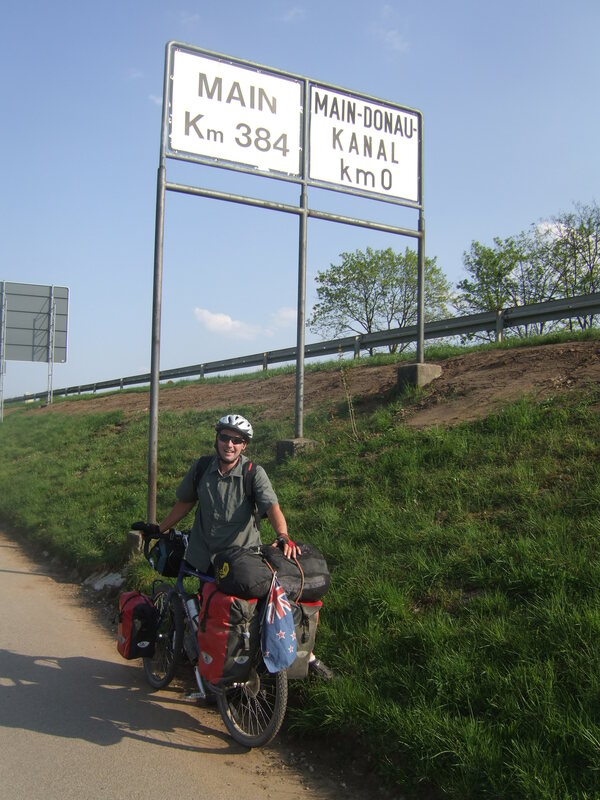 24 km later I was saying goodbye to Luxembourg and crossing over the border into Germany. 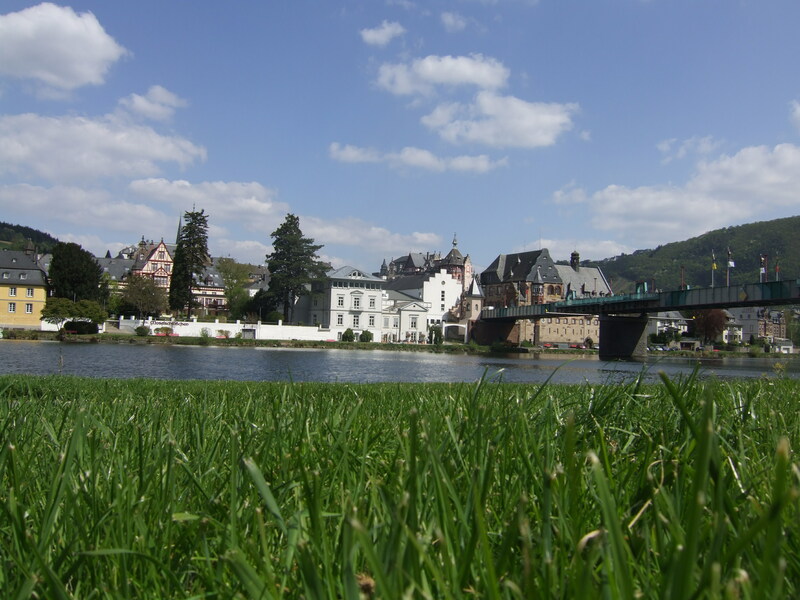 Here I picked up the river Mosel which I will follow for about 230 km over the next few days. 17 km down river I stopped for lunch in Trier, Germany’s oldest town. The highlight was the massive Roman gate which is said to be the best preserved in the world. Would have liked to have stayed longer but needed to push on to make my daily target which is usually a minimum 75 km a day. The cycle route is 90% along the river and sometimes takes you through the vineyards and down the tiny streets of an old village. This is a big wine region and in this valley there are grape vines everywhere and they grow the grapes on the steepest of hills. It is incredible how steep some of the vineyards are. 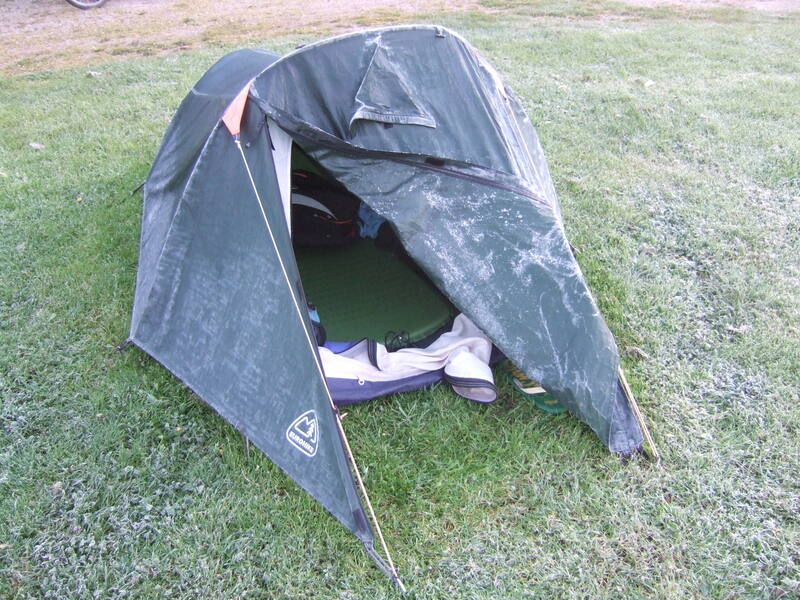 Overnight the temperature dropped to zero and this morning I awoke to find the door of the tent frozen and covered in ice. One good thing there was also bright sunshine. Unfortunately the first half an hour I was cycling along the wrong river bank because it was in complete shade and bitterly cold. It was bliss once I finally made it into the sun. Was finding it slightly hard going so on the spur of the moment I cleaned the chain and cassette. Oiled the chain and I was quickly back up to speed again. Must keep on top of the maintenance. Following the river you are always coming across ruined castles perched on top of cliffs. It’s been nice to see so much bird life and if you can’t see them you can always hear them chirping away. This evening I tried on the off-chance if I could have Wi-Fi connection. It wasn’t that off because from my tent on the bank of the River Mersal I was connected and | went mad skypeing anyone and everyone I could. It was so nice being able to chat to family and friends. Now that I am in Germany I hardly talk to anyone during the day. Not like Belgium where they were so friendly and helpful. START: 8:15 – FINISH: 16:30 – DISTANCE: 104 KM – RIDE TIME: 6H 31. Today was a good day distance wise clocking up 104 km.Tthough I really did feel the last 10 km. So for a good day’s work I treated myself to another schnitzel and a Bitburger beer. Only half a beer. But it still goes to the head pretty quick when you’re knacked. At this stage I think I am about 3 days behind schedule. I have been cycling 9 days straight at an average of 71 km a day. Overall I have cycled 919 km. So the 1000 km milestone will be coming up in the next few days. I think I will push on tomorrow for another big day Mainz is just over 95 km away. I really want to keep the km high so I can get a few spare days up my sleeve for later. Even with the high km I still had time to stop for a late lunch in Koblenz and check out the flower show. Well this morning I got up just before seven as normal despite the fact I was planning to have a lie in since it is Sunday. It’s just routine now. Not as much fun riding along the Rhein as the Mosel. 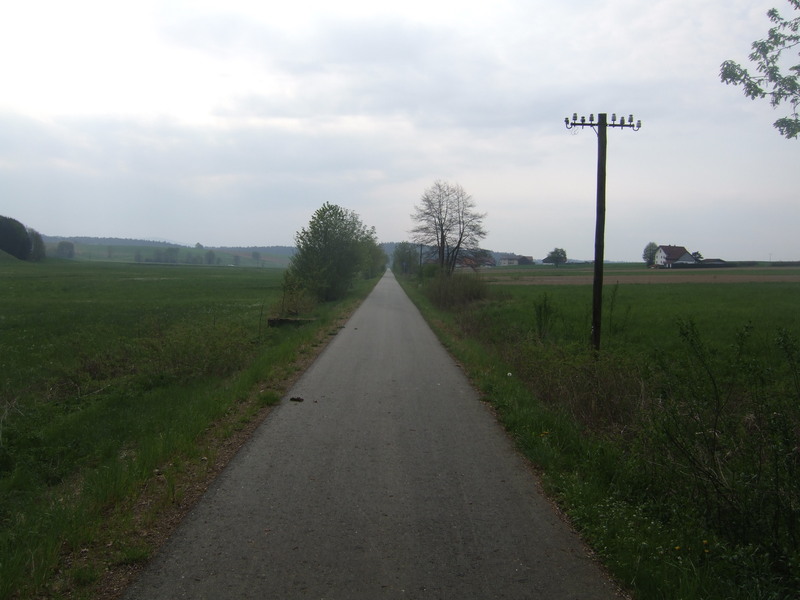 In a few places the cycle route ended and I was on the road. The last 30 km in to Mainz was a lot better as it was on an unsealed track on the river’s edge. 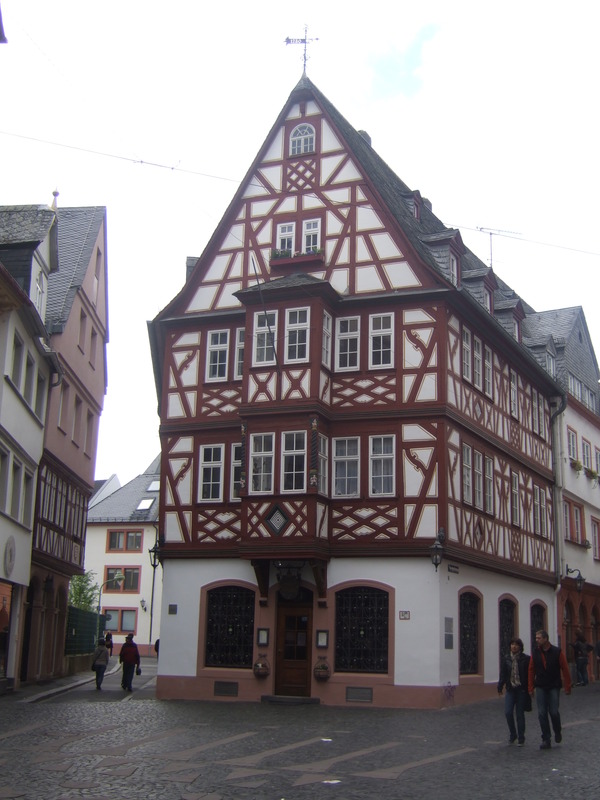 Had a bit of trouble trying to find a camping ground near Mainz so I had to venture into the city to find a hostel. Wasn’t that keen and I would normally cycle on. But I need to organize myself here before I leave the river and start my next leg which will have a lot more hills. Day 16 saw the milestone of breaking 1000 km, which is a good feeling………………………Will reset the counter to zero and start again. Think I will stay here two nights so I can have a rest day before the hills. Should really do some maintenance on the bike. Today has turned out to be a very productive day. I left all my gear at the hostel and headed to the centre’s tourist information office. Here the guy was great and had plenty of time to help me plan out a cycle route to get me to Passu, where I will be able to pick up the Danube. I then went to the book shop for some cycling maps. I then did a little supermarket shop. Sun screen and lip balm were at the top of the list. It is going to be 22-25 degrees here for the next week. Back to the hostel I grabbed my gear and headed a few more km south of the city to a nice camp site right on the river Rhein. So it’s back in the tent again. Though it’s just like being back at the Manor because my tent is right underneath the Frankfurt flight path. To top things off I am having a nothing afternoon relaxing in the sun watching the barges sail pass and the planes…………This evening I wandered off in to the village for some dinner and ended up spending a good 4 hours in a café playing on my computer, talking to Larisa the waitress who was from the Ukraine watching the football and I even had time for another Schnitzel. After a nice rest day it was back on the bike. Was still feeling tired from the days before. From Mainz I left the Rhein and picked up the river Main which I will travel along for the next 8 or 9 days to Passau and the Danube. While passing through Frankfurt I had a lady approach me after seeing my flag and ask if I was really from New Zealand. We chatted and she kindly invited me for coffee. Cornelia kindly invited me to go kayaking with her and a friend and also to stay in her house. It was very appealing but since I had only cycled 47 km and had just had a rest day. I knew I had to push on. 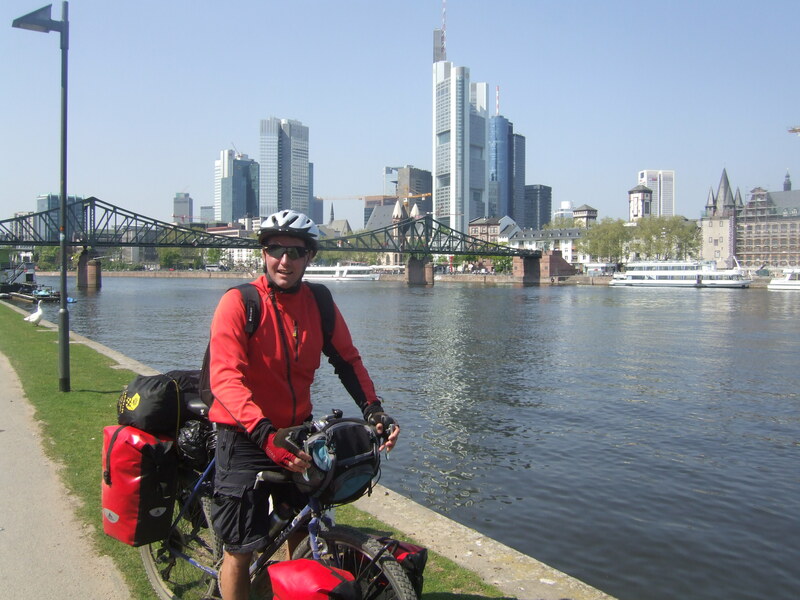 Just outside Frankfurt I had a guy approach me and ask if I was cycling to Cape Town. We cycled together and chatted for about 30 km before Werner kindly invited me for coffee and special Germany cake. Things got even better when Werner organized for me to overnight with him at his sister-in-law’s. Anna who was a lovely host and cooked us a lovely dinner and supplied us with lots of good French wine. It is starting to become a real habit to have a drink every night. We chatted until about 11 before calling it a night. 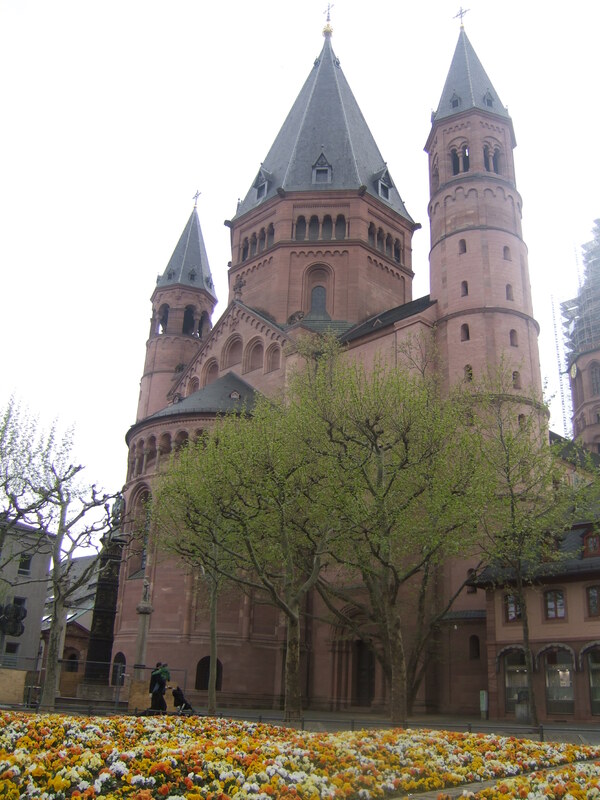 Between dinner and dessert Werner who is a retired Doctor took us for a tour around Aschaffenburg, the castle and its Gothic church. After being spoiled again with the luxury of a bed, Anna prepared an awesome breakfast of cold meats and cheese with really nice bread. I even got sandwiches to take with me. I have been very fortunate already so early on in my trip with all the wonderful interesting and kind people I have met. It really does make for such a wonderful experience and reinforces why I am doing this trip. 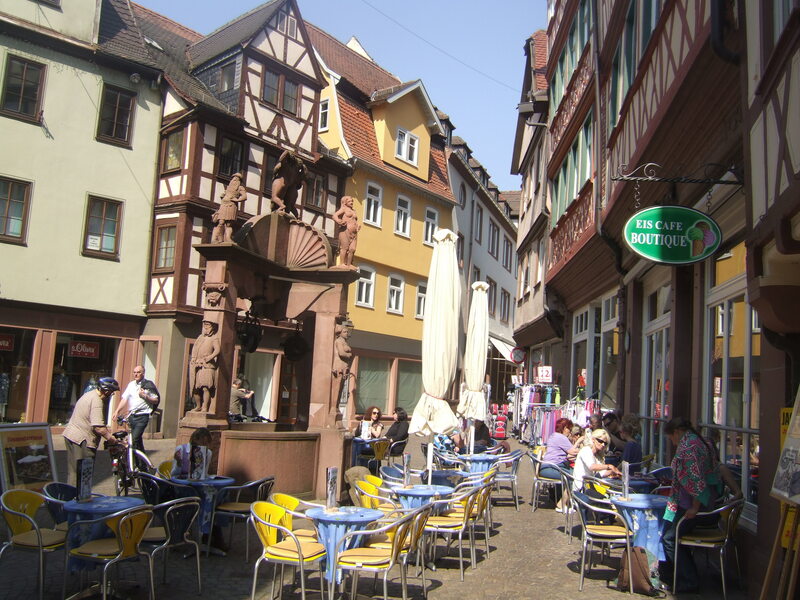 Werner and I continued on along the Main and stopped for coffee and cake again in Wertheim. Shortly after we parted company as I found a campsite and Werner pushed on for another 40 km. It was great having company for a couple of days. I have found a restaurant and will be having another schnitzel tonight. To be honest I really can’t be bothered to cook for myself. I have only done it may be 3 times on this trip. For 10 euro you can get dinner and a beer and some personal contact which is nice if you haven’t spoken to many people during the day. When the owner of the camp site heard I was staying he came and said hello. He was very interested in my story. After disappearing to the local bar he came back with a large beer. I really am starting to turn into an alcoholic on this trip. I saw a snake this afternoon lying on the trail in the sun. I had to swerve to avoid running over it. I set a cracking pace this morning: 21 km after 1 hour, 41 km after 2 hours, 60 km after 3 hours and after 4 hours 79 km. I will sleep well tonight because it was a hot day as well, which has left me pretty tired. I stopped in Wurzburg a small medieval town for a bit of a wander and to stock up on food as the shops will be closed tomorrow for Easter. 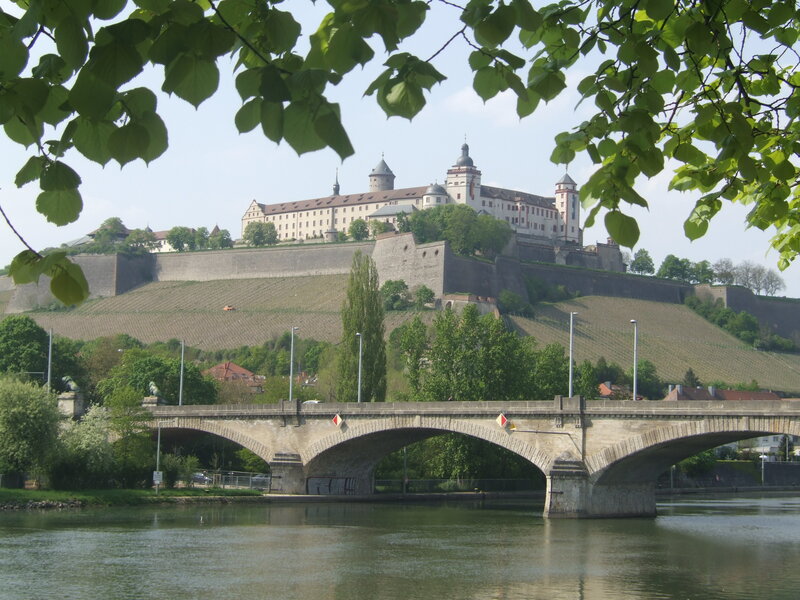 As I cycled out of Wurzburg, the river was heaving with everyone sunbathing by the river bank. Quite a few people have asked me where I am going. I replied New Zealand and they reply are you cycling to Frankfurt airport. Found the cheapest of campsites tonight. Only 3 euro a night at the yacht club. Went for dinner as well. Sat out on the river. Then disaster struck when I dropped my map in the water and then had to spend 20 min in the toilet trying to dry it out. with long periods going into the wind. I ran out of water after 120 km. The cycle trail was a little disappointing because for long periods it took you away from the river. Another milestone was the completion of the river Main from 0 km in Mainz to 384 km in Bamberg. Tomorrow I will start the Main Donou Kanal at 0 km. The campsite is again by the water. For something different there are beavers swimming in the river. I had a slow start after the previous monster day. Had a quick look around the medieval town of Bamberg and then headed out along the Main Donau Kanal. Started off cycling through the countryside. Then after reaching. Nurnberg the canal headed into the forest which was nice. Spent long periods up on top of the canal on a very dusty and bumpy path. Gave the bike a real pounding. Wanted a shorter day so after 80 km I started to look for a campsite, not so easy. After 110 km, I had had enough and settled for a spot with the motor homes. The ground was so hard I couldn’t even get the tent pegs in the ground. There were no showers so I went for a swin in the lake. It was £$££ cold…………..but I felt a lot better for it. Seven straight days on the bike and some fairly long ones at that. I am yearning for a day off. I know I still really have to push on. I have to cross the border into Iran by the 26th June. Sounds a long way off………….looking at the map I may still only be a quarter of the way. After an earlier than usual night, I was up and cycling by 6:45 am this morning. But before I started my neighbour in the motor home who was also up invited me for coffee. I cannot emphasise just how friendly people have been. It is one of the most enjoyable parts of the trip………to go with the great scenery and the feeling of feeling so much more healthier and not to mention fit. The horrors of the first day seem a distant memory now. Regensburg was a very touristic town with its massive gothic cathedral being its main draw card and the other where I could use the internet for 1 hour for the first time in 10 days. Everyone I speak to says you are very lucky with the weather for this time of year………….It is normally rain rain rain. 3 weeks of sun I am pretty well tanned. The good weather has brought out all the horrible bugs and mossies’ which come out to pester you when you are trying to relax in the tent with the door open so you can admire the view. I was after a bit of an easy day. 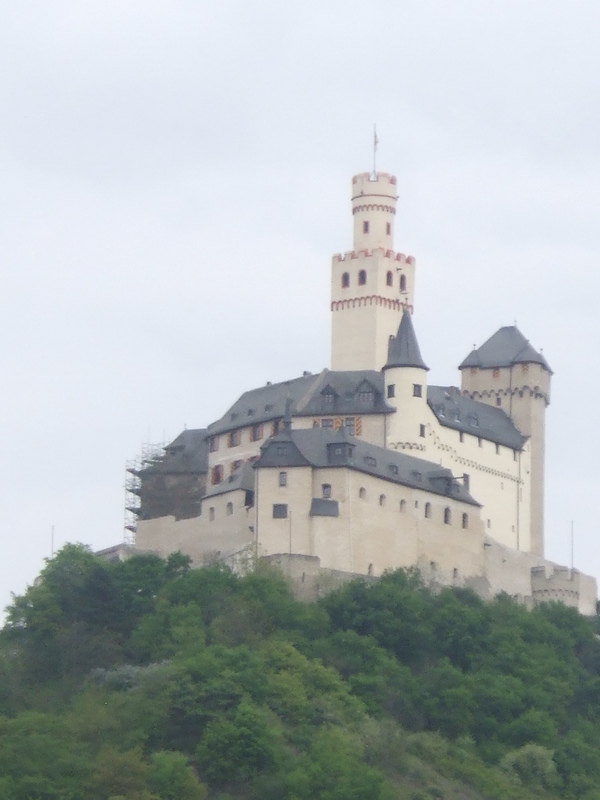 you also crossed my hometown, Trier. Very cool route through Germany, respect!